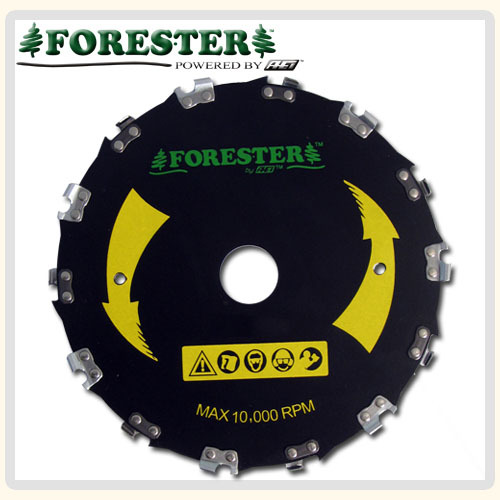 This is our Forester Brand Chainsaw Tooth Brush Blade. The blade is very easy to use on a trimmer with a 1" arbor. The blade has 20 teeth. I am telling you this thing is a beast a cutting brush. You will be able to sharpen the teeth with a standard round file for years of use. We have a 7" and 9" blade available. This listing is the 9" blade. The max speed is 10,000 Rpm's and I will recommend using some leg protection and maybe some anti-vibe gloves with this item. If you have any questions let us know. I've got a 9" blade on my Husqvarna 345 FR, and it's transformed it into an even more versatile tool. With the chain saw blade, I can quickly and safely tacke jobs that would have previously required bringing both brush cutter and chain saw. I'm very pleased with it, and the way it quickly cuts through bigger stuff!